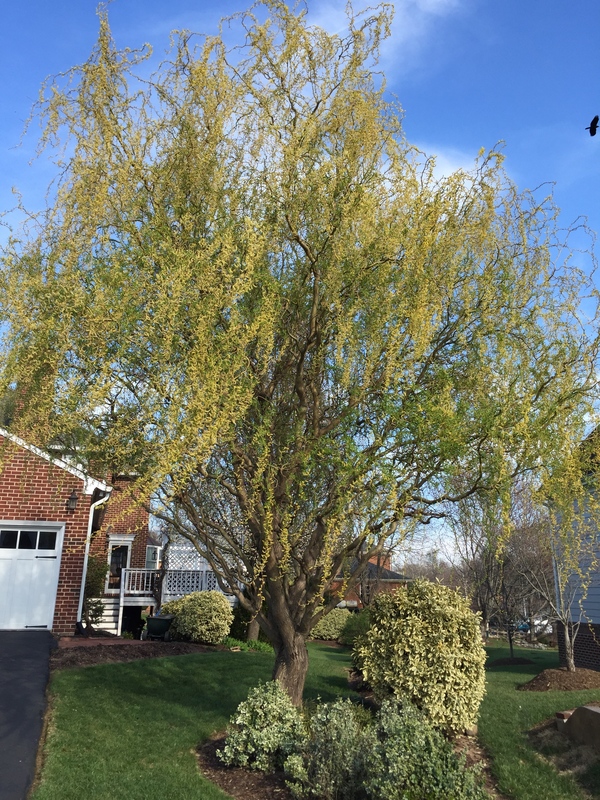 Spring Cleaning — Outside, Too! 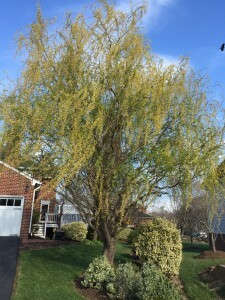 The curly willow was the first tree in my garden to start its new growth. This year, it has doubled in size! This has been a very strange spring so far, with weather not being able to make up its mind between winter, spring or summer. There have been some really turbulent wind storms as well. Even still, I’m doing my best to get the garden and house in tip-top shape. There are many projects underway and inspections taking place. 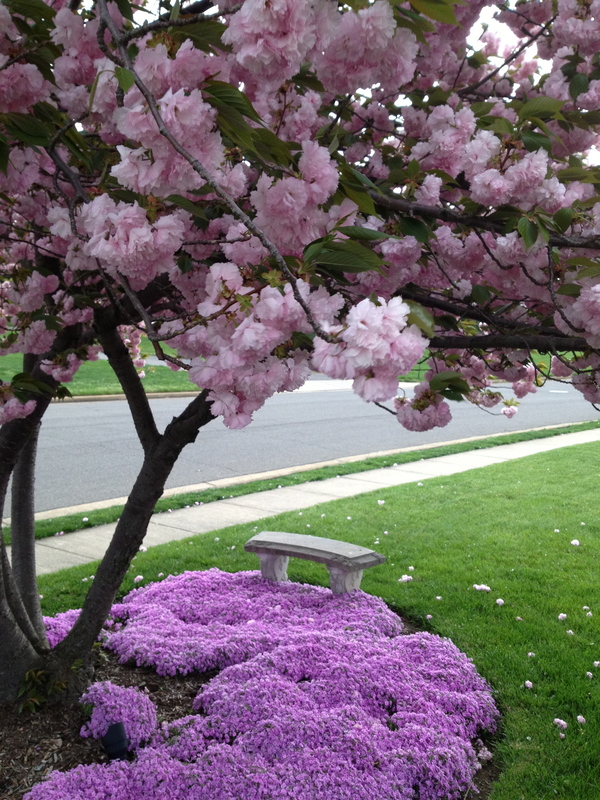 I will walk you through a few of the big ones that you might find helpful in relation to your own home and garden. While I’ve been getting the perennials and bushes trimmed up and ready for new growth, the cleaning outside has started from the top down. 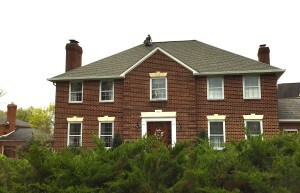 Here’s the before picture of our roof taken at the end of summer. You can see the black streaks appearing. It’s been five years since we had our roof cleaned, and it had developed black streaks from algae and air pollution again. Last time only the north-facing front was grungy, but this time there were streaks on all four sides. The method of cleaning has improved greatly since the last time. Now the technicians spray the roof with a special soaking nozzle using a detergent that makes quick work of cleaning the shingles. This is far better because it does not damage or wear the roof like the machine scrubber of the past. Here’s the after photo — all clean now and squirrel damage repaired. Now it’s good as new! 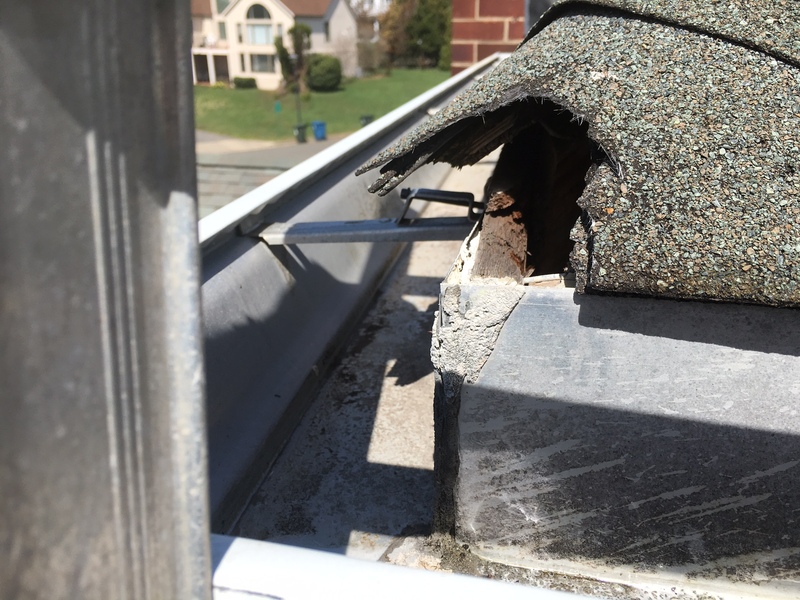 They also did an inspection and discovered 3 spots where squirrels had chewed up the shingles trying to get inside. We quickly had that fixed. I recommend that everyone have their roof inspected each year. The damage on ours wasn’t visible from below, so we would not have even known until water damage became visible inside. That would have been much more expensive to fix! 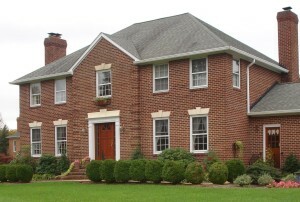 Here’s why I think everyone should get a roof inspection. This is where a squirrel chewed a hole right on the corner. You can’t see it from below, so we wouldn’t have known it was there. 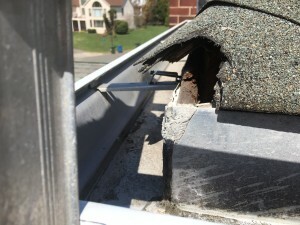 Many roofing companies will inspect at no cost and take pictures to show you damage that they find. Many thanks to the A Team Roof Cleaners, and Marshall Roofing for the repairs. 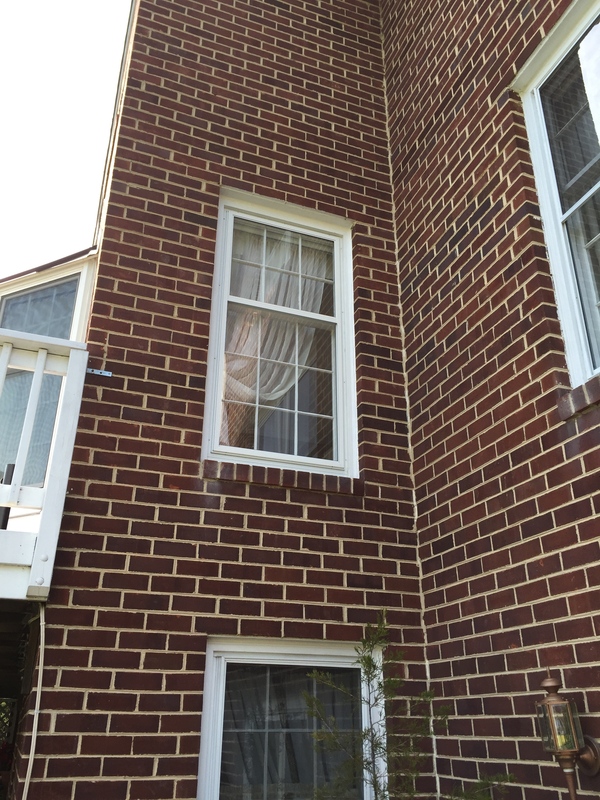 BEFORE— The 30 year old storm windows. Back then you only had one option of where you could place the center bar, only in the middle of the window. That meant looking at it every time you looked outside – not pretty! 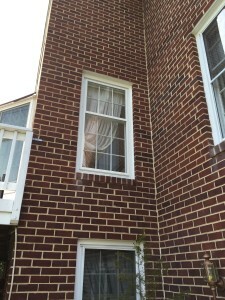 I am also back on track replacing ten of the storm windows on the main level of the house. I’m always a “bring the outside in” kind of girl, so having proper windows is important to me. The former storm windows didn’t match up with the style of window in the house, so instead of looking out of a pretty wooden window, we had been looking at an ugly metal bar in the middle of our view. The new windows are great, and even come with a new coating that helps them stay clean — YAY!!!! I love that feature. Anyone who is considering window replacement look at this option first. 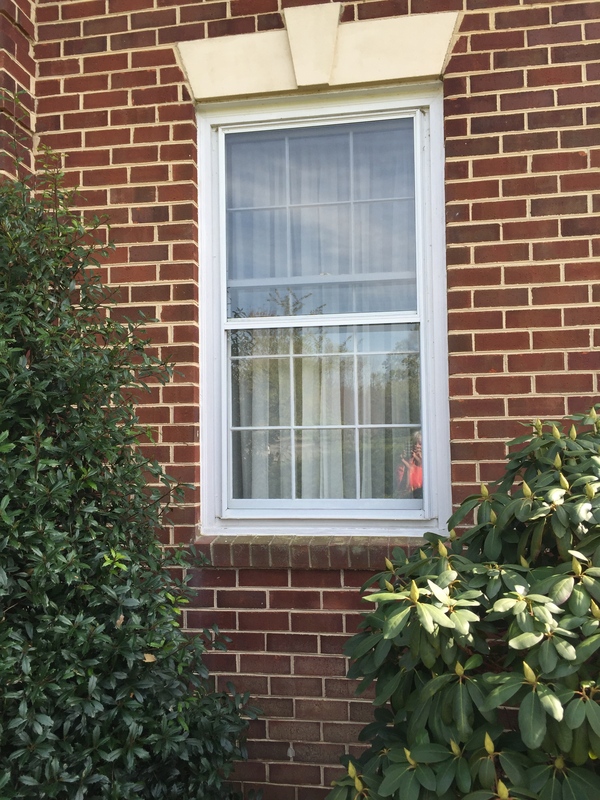 The new storms provide great R-value, and in our case were 1/10th the cost of a window replacement. 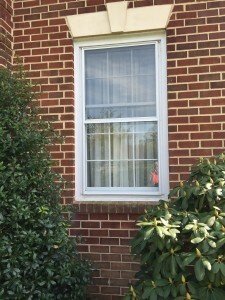 Here are the nice new storm windows – with the center meeting bar where it should be. And bonus being a special coating to help keep the windows clean! That’s a fantastic savings! We chose Larsen Gold Series Storm windows — I’m not a paid spokesperson, but I do believe in sharing my sources. I also still need to scrub down the north steps in front of the house. I like using oxygen bleach and then rinsing it well. Makes the stones and the grout look like new. And this year, I’m determined to actually finish power washing the sidewalk. There’s always some touch up paint needed on the trim work. It all takes time, but in the end, it makes everything so much nicer. Those of us who live in the Washington, D.C. area are very happily watching our national cherry trees blooming, and that means mine are not far behind. So as I wait on my beautiful cherry tree to start opening up, I’m checking off things on my to-do list for this spring — hope that yours is on its way, too. Happy gardening!